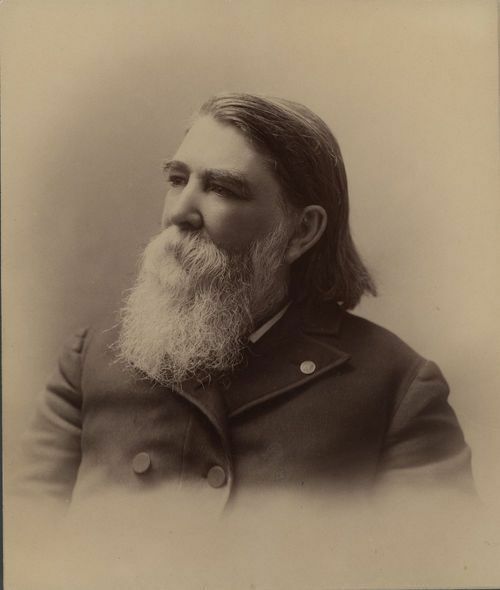 A sepia colored portrait of Richard Josiah Hinton, 1830-1901. Hinton a New York journalist and an anti-slavery advocate moved to the Kansas territory, in June of 1856, to battle against the expansion of slavery in the new territory. Shortly after his arrival in Lawrence, KS, Hinton soon advocated against slavery by writing to Eastern newspapers about the turbulent affairs in the Kansas territory. The numerous newspaper articles penned by Hinton reflected the individual's views and opinions of a free-state without the institution of slavery. By the early part of 1862, Hinton was recruiting volunteers for the First Kansas Colored Infantry Regiment, and was appointed the rank of first lieutenant to the Regiment. He continued to move up in the military ranks with the promotion to captain of Company B, Second Kansas Colored on October 21, 1863. In November of 1865, Hinton mustered out of military service having reached the brevet rank of colonel. He finished the war serving as acting inspector general of the Freedman's Bureau as well as being sent to the South for secret service work ordered by President Abraham Lincoln. Following the war Hinton contributed articles to many different magazines and wrote several books, including John Brown and His Men: With Some Account of the Roads They Traveled to Reach Harpers Ferry (1894), an admiring biography of Hinton's old leader and hero. He, also, held several politically appointed positions within the federal government (i.e., United States commissioner of emigration in Europe in 1867; inspector of U.S. consulates in Europe; special agent to President Ulysses S. Grant to Vienna in 1873; special agent to the Departments of Treasury and State on the frontier and in Mexico in 1883; irrigation engineer to the U.S. Geological Survey from 1889-1890; and special agent in charge of the Department of Agriculture from 1890 to 1892.) While on business in London, England, Hinton died suddenly on December 20, 1901.